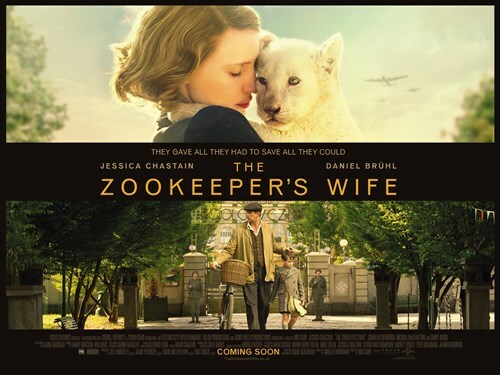 The Zookeeper’s Wife is an excellent film about a family owned zoo that is transformed into a hiding and holding area for Jews trying to escape German occupation in Poland during WWII. Jessica Chastain gives an Oscar-worthy performance as Antonina Zabinska, the wife of zookeeper Jan Zabinska. First, there is her real connection to the animals under her care. I don’t know how much was real and how much was special effects, but I was convinced that Jessica had a personal connection to these animals. Then there is the emotional range she displays throughout the film. After watching the film, I went online to see what kind of reviews it got. I was shocked that it had only a 60% favorable critics rating on Rotten Tomatoes, but not surprised that it had a much better 78% audience score. Some of the negative comments were just ridiculous: I didn’t like her polish accent; your time will be much better spent in an actual zoo; a missed opportunity, etc… I don’t know what planet these critics come from, but I’m guessing that they are the same critics that gave the awful Guardians of the Galaxy Vol 2 film a high rating. That film was so poorly written that the half dozen or so writers responsible for such a sophomoric script should stick to sitcoms. Here’s a tip – if you’re trying to decide on what to stream and you’re considering Guardians or The Zookeeper’s Wife, you won’t go wrong with Jessica Chastain. Written by a woman, based on a book by a woman, starring a woman, and directed by a woman. I’m all for girl power.